If it’s possible to work out within millimetres whether a tennis ball is in or out of a service box at Wimbledon, then it’s possible to put the same technology to use judging whether a car has put a tyre all the way over the white line at the edge of the track. Stick cameras on five critical corners and after a car has gone off the track limits three times, that’s a five-second penalty to be added at the end of the race. 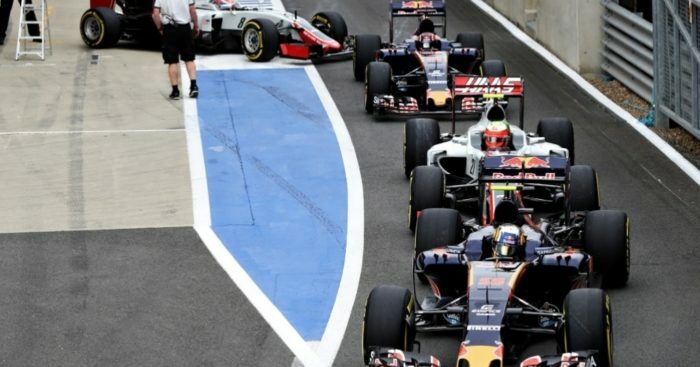 If a driver is on two-strikes towards the end of the race, then one slip-up could lose him places. We’d like to remind the readers that F1 wasn’t made for gamblers, unlike bingo. When it comes to the best bingo websites, we would advise you to play bingo through BestBingoSites, as a site for reliable betting information. The thing that really mixes things up in the order is when drivers get poor starts. It lost Lewis Hamilton the 2016 World Championship. Now that the drivers have been coached to manage the starts more themselves, poor starts are less frequent, and that’s because of all the practice starts they’re allowed in FP1, FP2 and FP3. Limit it to FP1 only and see how they get on. With bigger tyres and more downforce for 2017, the cars are likely to be braking in a shorter distance than ever. Thus if we want more overtaking It is critical that drivers don’t move in the braking area. It was a rule that we saw beginning to be enforced at the end of 2016 with Vettel vs Ricciardo in Mexico. To assist implementation of this rule there should be either an audible signal the moment the driver touches his brakes, or an on-screen telemetry trace from the onboard camera. Thus viewers can see in one shot whether the brakes are being applied as a driver changes direction. It might cut out a lot of the post-race wrangling, and we get a result when the cars are on-track, not four hours afterwards. Drivers are getting lazier than ever about lapping backmarkers. On tight circuits where every tenth of a second counts it’s important they get out of the way quickly, but on four of the wider circuits – say Malaysia, China, Silverstone and Austin, let’s introduce a new no-blue-flag race and see how they cope. Last year there were instances when drivers lost time and places because of the lottery of the VSC (Virtual Safety Car) coming out after they had made their stop and others taking advantage. The VSC was designed to hold drivers in position at a slower speed, but because of that slower speed, any pit-stop made under it loses less time than one made at racing speed. Thus from now on, no pit-stops (in dry running) can be made under the SC or VSC. We’ve been told that the 2017 Pirelli rubber is going to be more durable than before, so the tyres will last. We’ve been told today how the FIA are going to insist on track changes for all circuits because of the increase in cornering speeds for 2017. So what is Monaco going to do? One thing they could do is provide an overtaking place. If you extend the tunnel exit along that boulevard where the escape road is – the straight between the chicane and Tabac can become much shorter and give a decent chance to overtake. There IS space there, just a lack of willingness to adapt the circuit. This has been suggested for years, and used to be in the rules when F1 started. When you get a single point for 10th place, there really should be points on offer for the fastest lap. Although he didn’t help himself with some duff starts, Lewis Hamilton should have been World Champion if he hadn’t had an engine failure while leading in Malaysia. Instead of amassing the scores of all races, select the best 18 from 21. This allows drivers to discount races where they had mechanical problems or got punted from behind through no fault of their own (as Rosberg was by Vettel, but happily managed to continue ). Again, this used to be part of the rules. Make the DRS available whenever drivers want… but only for 10 laps of the race. They choose the laps they want to use it. At the moment, drivers in danger of being overtaken can store up energy to give them a boost through the vulnerable DRS zones. By removing the knowledge of exactly when and where they are going to be attacked, this nullifies the effect of the DRS. The randomness introduces a bit of jeopardy. Drivers who plough on through the race and eke out the life of their tyres with one stop don’t generally provide an exciting spectacle. In fact some might say they’re a pain in the arse. This rule is the most controversial of the ten. Every team must pit for a minimum of two stops IF the winning car makes two stops. If Pirelli are making less degradable tyres in 2017 and it’s harder to overtake, then there might be a tendency for mid-grid teams to block the road and one-stop a lot. Thus one-stoppers might be obliged to make an extra stop. There is also the strategic element of the leaders being able to shake up the midfield by putting in a cheeky last-minute pit-stop obliging everyone else who hadn’t made one to follow suit. This could even be extended so that teams have to match the winning car if they make three stops. Imagine the fun you could have late in the race if you were leading by a safe margin and had the opportunity to disadvantage rival teams by putting in a late stop. Everyone dive for the pits!